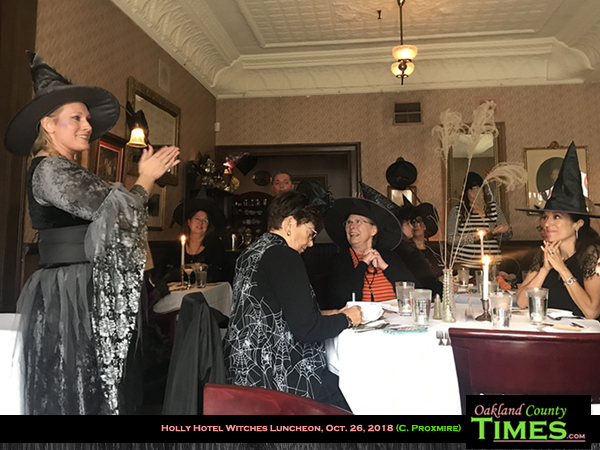 Holly, MI – The Holly Hotel has been getting magical this weekend with their annual Witches’ Luncheon. 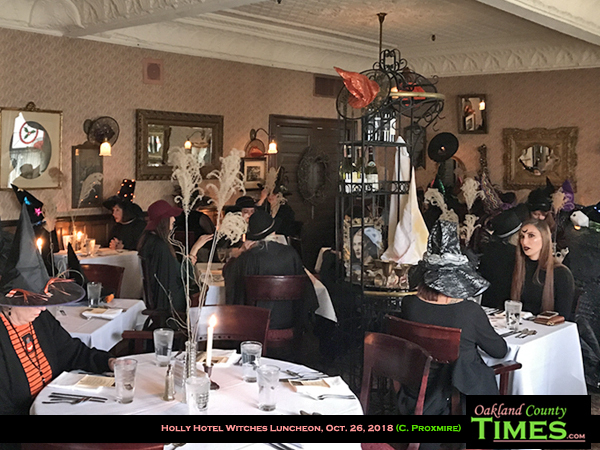 The event attracts people with tall pointy hats and black dresses from all around the state who revel in the creative culinary creations and the cackles of friends. 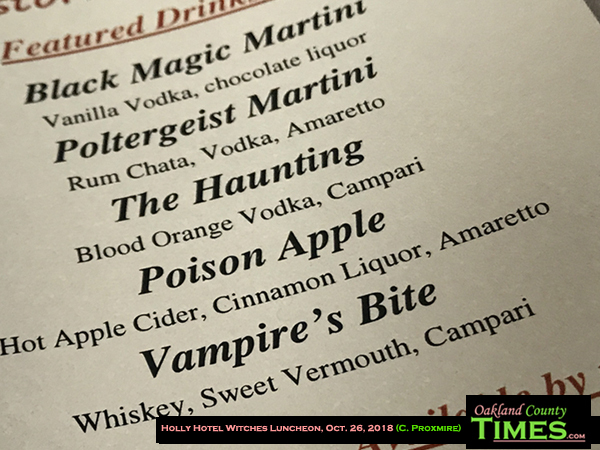 The menu gave the event it’s special spooky twist. 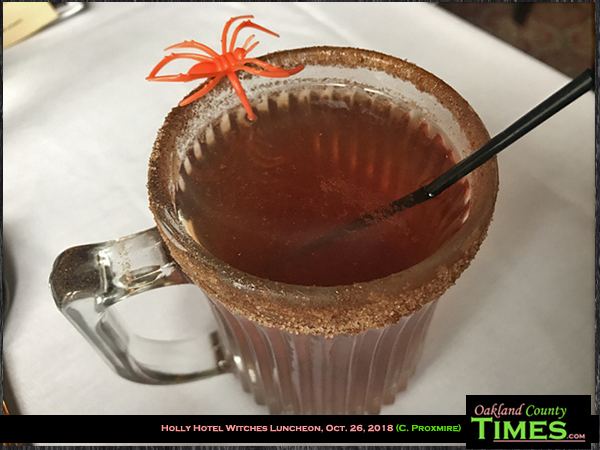 I started out with a “Poison Apple” drink, made of hot apple cider, cinnamon liquor and amaretto in a glass mug lined with cinnamon sugar and adorned with a plastic spider ring. 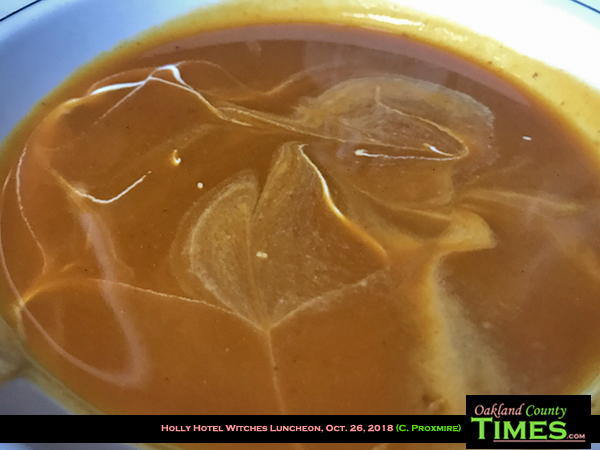 The first course was delicious pumpkin spiced curry soup with a marshmallow web. 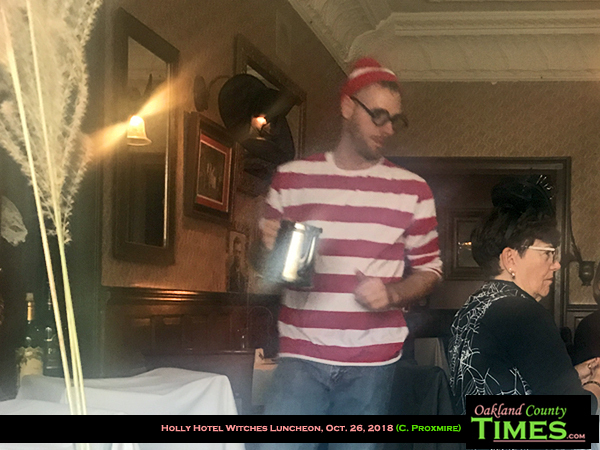 This was a lovely way to warm up guests for the horror-inspired main course. 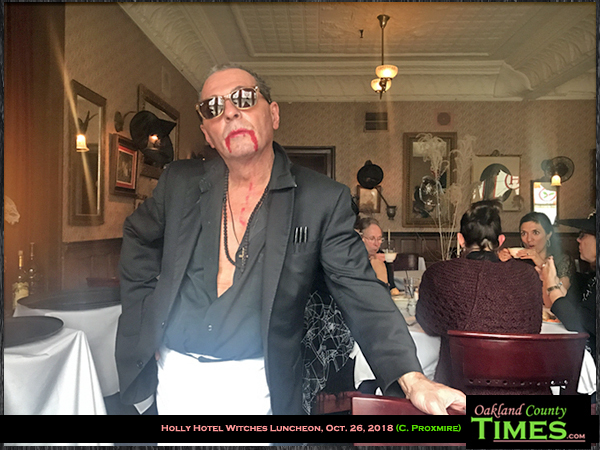 Mine was the cedar-stabbed beef tenderloin, a steak with an actual wooden stake stabbing it. 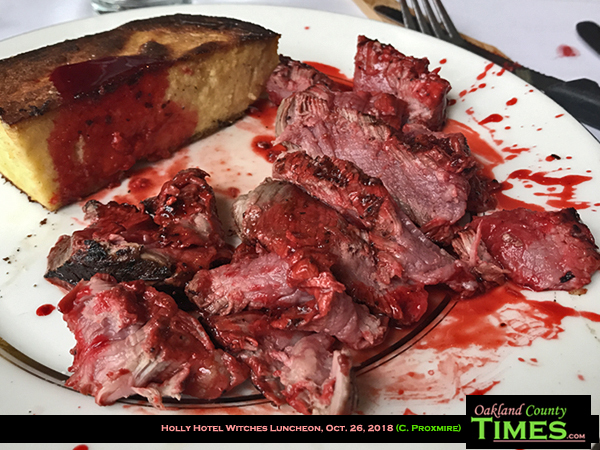 The addition of bright red beet blood splatter made this meal a delightfully scary sight. 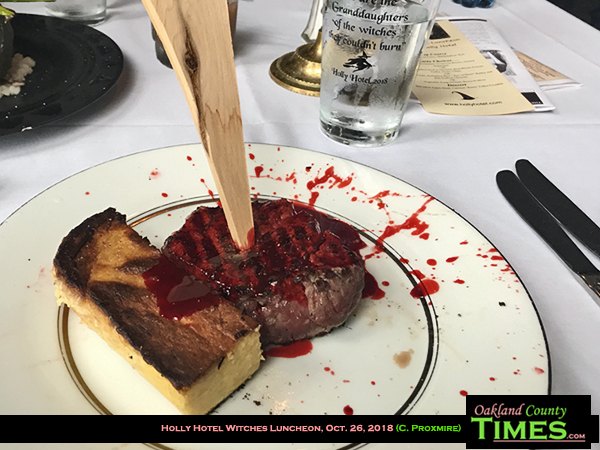 Along with the steak was a mini coffin of polenta, also marked with the beet blood. 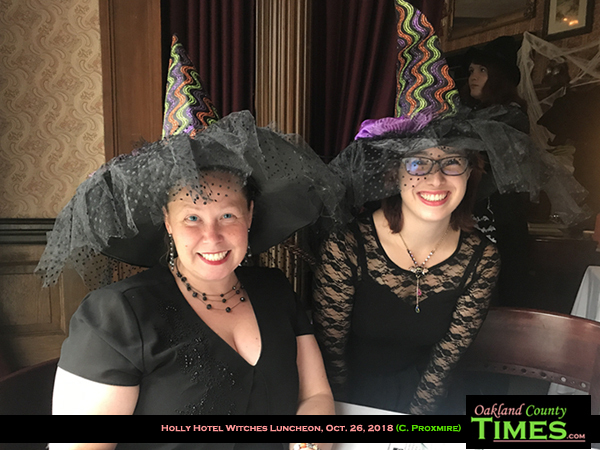 Katy Hughes, DDA Director and Village Assistant Manager, joined me for this spooky tradition. She enjoyed a cauldron of chicken vegetables and toadstool risotto. 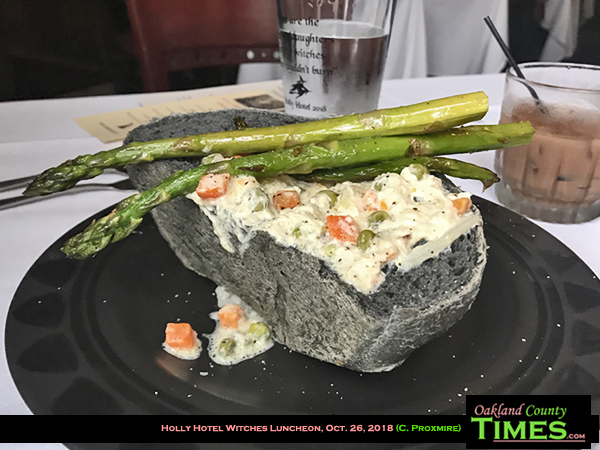 This bubbly mix was served in a “cauldron” made of a darkly-dyed bread bowl, and it was topped with some sprigs of grilled asparagus. 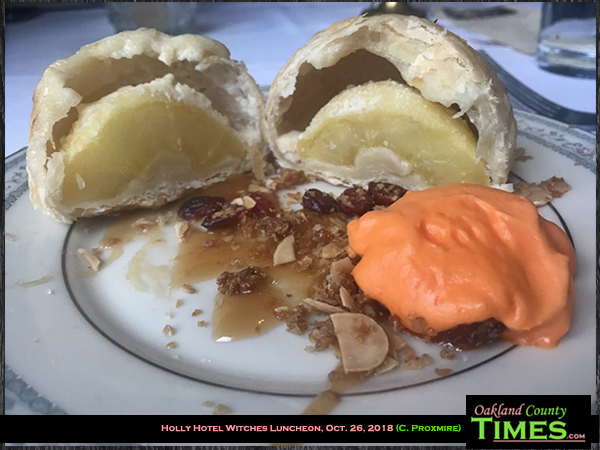 Desert was a “shrunken head” made of apple inside puff pastry and served with caramel butter toffee crunch. 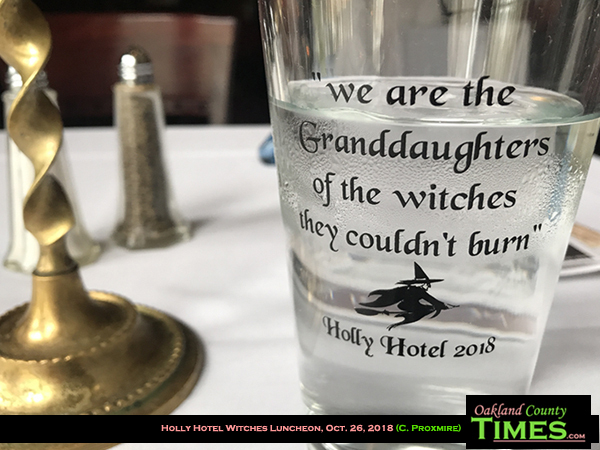 There were also drawings for prizes and witches were given a commemorative glass to remember the event by. 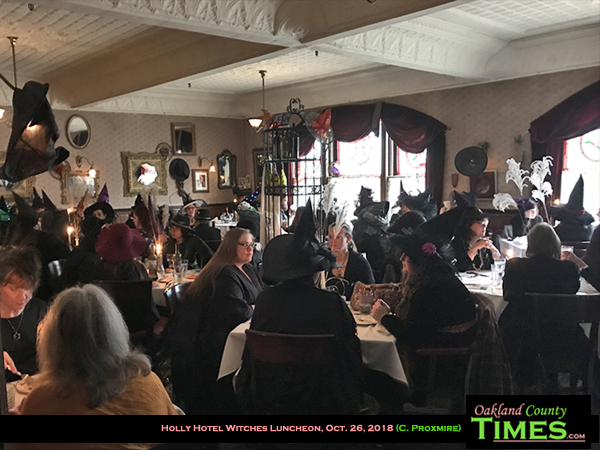 The Witches’ Luncheons are sold out for this year, but there are many other themed events coming up, including Tea and Tarot Palm Reading, Wild Game Dinner, Victorian Thanksgiving Dinner, and many more coming up for the holidays. There are also regular comedy nights, as well as a regular delicious menu. 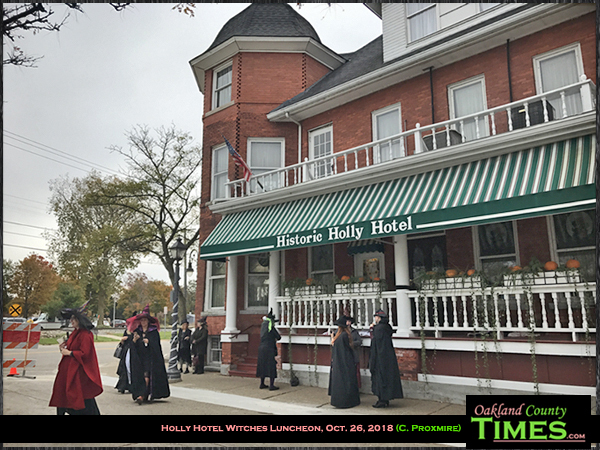 Holly Hotel is located at 110 Battle Alley in Downtown Holly. Learn more at www.hollyhotel.com.